What a lovely home! Our family loved this spacious house. It was clean, the furnishings were beautiful the art work amazing! Beds were comfy. The kitchen had everything you could imagine. It snowed and they kept the steps and walkways clear. Cost to everything! We LOVED Teri's place. We were there for Christmas and it was beautifully decorated for the holidays throughout. The condo is in a classic Chicago 3-flat on the 2nd floor. The three bedrooms are cozy and were plenty big enough for our family of 5 (mom, dad, and three teenagers). The two bathrooms were updated and sparkling clean. Teri has thought of everything--from coffee and tea, to TONS of fluffy towels, to well-stocked body wash, shampoo, and conditioner. She even left us a sweet little gift of Christmas cookies upon our arrival. The location was great--just a block off of Southport, which has tons of shopping, restaurants, and entertaining. There is also a huge Jewel just around the corner--an easy 5-minute walk. Perfect when you have a late arrival and want to have breakfast food for the morning! There is also a beautiful backyard--that we, unfortunately, didn't get to use because of the weather. We will be back soon, though! My family of 5 adults and two children spent Thanksgiving 2018 at Chicago Guest House in the first floor unit at 1216 West Newport ave. This is a beautiful, safe neighborhood that is walking distance to great restaurants, bars, and shopping. The home was spacious and perfect for our needs. Terri had EVERYTHING you could ever need to cook and serve Thanksgiving dinner at a beautiful dining room table. The eat-in kitchen with a table and breakfast bar was a perfect gathering place for our informal meals. There is a living room upstairs and a family room in the lower level that allowed us to spread out. The only thing my kids needed to bring for their 2 1/2 year old and 10 month old was a stroller- Terri had a crib, porta crib, high chair, booster seat and baby gates!! On top of all that, the place comes with a garage spot and permit parking on the street. Our group of 7 stayed at this guest house over the Chicago Marathon weekend and we are soooo happy we found it! Not only is it located in a safe, beautiful neighborhood only steps from restaurants and shops, it's also an absolutely gorgeous house with all the amenities we needed. There was plenty of space for everyone, modern furnishings, comfy beds, and even a parking spot! We couldn't have asked for a better place to stay - thank you Teri for such an amazing experience, we'll definitely be back! This house is a true gem! Searching for a reasonably priced house to accommodate 7 adults during the weekend of the Chicago Marathon was a tall order, but this house delivered on all fronts! With plenty of beds/bedrooms, a large living area and kitchen, two full baths, and a great outdoor space in a wonderful neighborhood, we couldn’t have asked for a better stay. The house was located close to shopping, restaurants, and bars, and we enjoyed the walkability to so many great options. The tree lined street was picturesque Chicago! If we are ever back in Chicago, this house will be the first we check. This apartment was absolutely wonderful. Had everything we needed, was close to shops, restaurants and things to do. Walking distance to Wrigley Field which we visited. Gorgeous little back patio where we spent most of our time if we were here. Was our own little home away from home. Will definitely be coming back. The company I work for has rented this property several times over the past 10 years. The space is great for us and each time a new employee makes the trip, they always comment on the beauty and perfect location of the home. This visit, I have been responsible for cooking for our group during our stay, so I have seen first hand how great the staff is here. The house is immaculate and the staff is always eager to accommodate - they go the extra mile in keeping everything clean and refreshing linens each day of our stay. Lucy has especially been great to us, making sure we have everything we need and that our stay is going well. All this said, we look forward to returning in the future. We stayed on the second floor of the W Newport property and it was absolutely perfect! The bedrooms were very comfortable and my nephews appreciated the room with the twin beds. The shower is a little puzzling to figure out, but really nice when you do! The place is big, beautifully furnished and decorated. It's a short walk to Wrigley Field, The Blue Man Group, shopping, and restaurants. 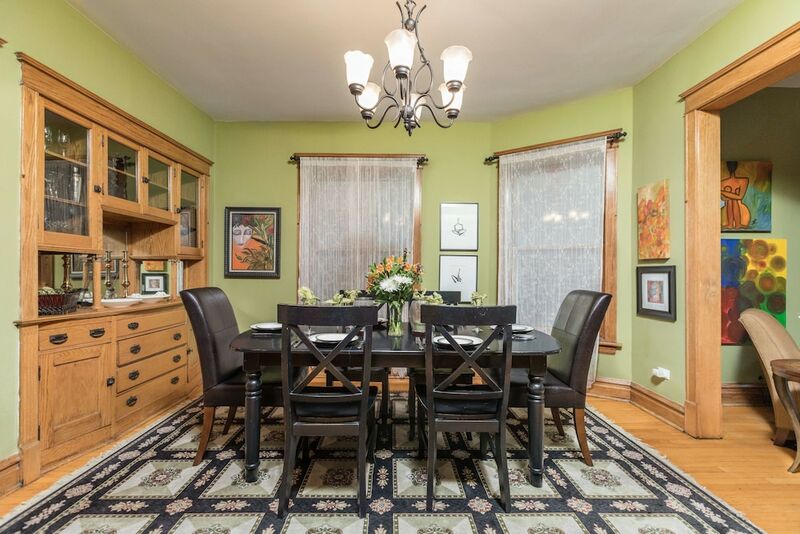 Located in Wrigleyville within a 5-minute walk of Wrigley Field, this property is within a mile (2 km) of other popular attractions like Vic Theatre. The 4-star accommodation includes a kitchen, a patio, and a living room. The accommodation is individually decorated and features a kitchen, 2 bathrooms, and a patio. There's space to spread out with 3 bedrooms, a living room, and a dining area. Guests can expect to find a TV with digital channels and first-run movies. Pillowtop beds sport Egyptian cotton sheets and down comforters, and the bathroom offers a hair dryer and free toiletries. Other standard amenities include a washer/dryer, a private yard, and a coffee maker. Guests staying at this property enjoy free WiFi in public areas, express check-out, and a TV in a common area. Helpful staff is there to provide luggage storage, as well as offer insight about the area. Other amenities at this historic property include barbecue grills and a garden. The preferred airport is Chicago, IL (ORD-O'Hare Intl.). Distances from the property's location to the airport are straight-line distances and may not reflect the actual travel distance. A front desk is not available at this property. Guests must make arrangements for check-in by contacting the property in advance of arrival using the information on the booking confirmation. Guests will receive an email from the property manager with check-in and check-out instructions. Hotel Registry Number: R18000033567Parties and events are allowed on site. The property can refuse certain bookings for the purpose of group events or parties, which include pre-wedding stag/bachelor and hen/bachelorette parties.